I didn't get any mail today but I did get some cards. Since I started the baseball card collection or in other words, cards not in my other collections, I figured I'd pick up some packs here and there. I haven't picked any up in a few years because I only spent money on cards for my collections, but now all those cards in the pack will go to a collection. I'm not going to buy a bunch or anything but I may pick up at least a pack from most releases and as you all know, the first release is up, 2019 Topps. I went to Walmart after work yesterday and had planned on picking up a blaster but they were pretty much out of everything. All they had were the 16 card packs and while I don't normally grab packs from a retail outlet like that because of pack searchers, I was already excited about grabbing some cards so I grabbed 5 of those packs. I won't go through a boring post of everything I got, I did get them logged into the Trading Card Database so if you have the need to see everything I got, you can go there. 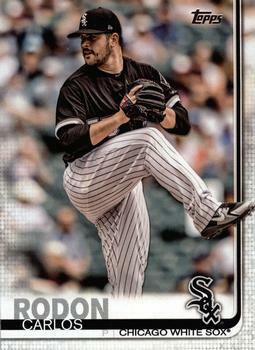 I will show you the cards I got for all my other collections, which is only one collection, the White Sox collection. 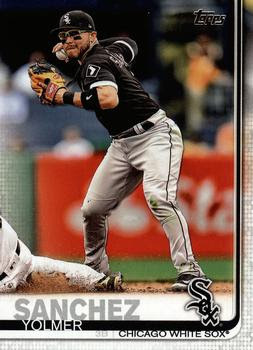 This would be the first White Sox card I pulled for 2019. It was in the first pack so I thought maybe I'd get a few since I started out so well. Nope, I only got the 2 and this card came in the last of the 5 packs. It was fun opening packs again, I actually opened them in the parking lot because I was waiting on my groceries to get put in my car. I flew through them and then went through them slower once I got home. I didn't get any short prints, variations are anything special. Base cards and inserts. It wasn't a terrible start to the 2019 card year, I did get 2 Sox cards.